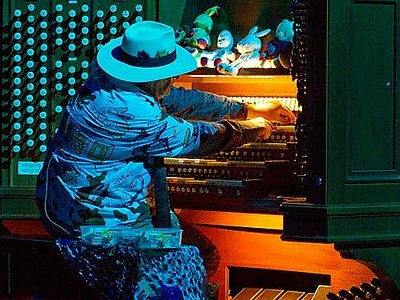 Described as being one of the founders of minimalism along with his peers Glass, Niblock, Riley and Young, Charlemagne Palestine prefers to call himself a maximalist. His preference for playing the biggest, loudest piano in the world and his passion for making entire buildings resonate with carillon bells do seem to better fit his own perspective. While his most famous work Strumming Music, might expound the minimalist theory as it comprises only two notes played on a piano, it's actually the reverberations, layers and complexities that most interest Palestine. He can achieve this kind of sonorous disturbance most satisfyingly with his carillon bells, moving the very air around him, "playing the entire building". Having influenced a range of artists from John Cale to Nick Cave, jammed with luminaries like Ginsberg and being scolded by Stravinsky, Palestine's signature drone has resonated all over the world, where he continues to perform concerts and festivals and create and collaborate with the artistic pioneers of today. I began by singing! First imitating the pop singer of the time Johnnie Ray when I was 4 years old. He had a strange method of singing because he was deaf in one ear and sang in a spasmodic style with his body jabbing to the articulations of his voice! My favourite two songs of his as a kid were "Cry" and "The Little White Cloud That Cried". I will say living in the Boondocks of deep Brooklyn. In those days my neighbourhood in Brooklyn, though only 12 miles from the Empire State Building, could have been New Guinea as far as knowledge of contemporary important culture of the time was concerned! The immigrant mayor of NYC during the '30s Fiorello LaGuardia had the idea to create high level speciality schools for talented and motivated children of immigrants. In 1936 he created the High School of Music and Art. At 12 years old I took an audition for the High School of Music and Art by singing some American pop songs and some Jewish sacred songs and miraculously I was accepted and that changed my life forever! I had to travel one hour and a half each way from where we were living in Brooklyn to go to that school which was located in uptown Manhattan. Many of the children who went to the school's parents were upper-echelon European immigrants who were already internationally famous and sophisticated and their kids were way over my head in cultural knowledge and experience ... so I had to struggle to quickly catch-up and become a Manhattan cultural heavy and not remain a dumb schmuck from Nowherezzzville Brooklyn anymore. Since then I have a curiosity and a need to know as much as I can about culture, art, anthropology, sociology, psychiatry; all subjects under the sun. And, as it was better to stay in school in the mid '60s till the mid '70s to keep from being drafted into the Vietnam war, I took dozens of subjects during my school years and continued for 8 years in different schools eventually achieving a Bachelor of Science which has served me zilch after that. Keith Rowe once asserted that it is often certain people that "give one permission to do things". How was that for you - in which way did the work of particular artists before you "allow" you to take decisions which were vital for your creative development? There's a funny incident that occurred when I was a young teenager. My girlfriend's father was then the French horn player of the Columbia Symphony Orchestra that was recording all the orchestral works of Stravinsky conducted by Stravinsky himself at a recording studio in Times Square for Columbia Records. One day my girlfriend's father asked me if I’d like to witness a rehearsal of the orchestra with Stravinsky conducting. Of course I said I'd love to! So I went and the members of the orchestra found me a place on a side of the stage they were playing on where I could watch Stravinsky directing without him being aware of me as I was behind a dressing screen. At a certain moment during the rehearsal Stravinsky became furious about a certain passage that he found the orchestra playing incorrectly and suddenly he shouted "what's that damn screen doing here on the stage?" Quickly an attendant ran and pulled the screen away and there I was sitting behind it. Stravinsky looked me in the eye and shouted to me "who the hell are you and what are you doing here?" I was taken so much by surprise that I couldn't come up with a better answer than just to say "I...I...I don't know!" Then there was total silence in the room as he looked long at me and by then I was terrified at being caught by the angry maestro like that. Finally he calmed down and said to me in a lesser shout, "you can stay!" Afterwards, I no longer needed the screen as he let me watch him in plain sight and I even was invited back the next day. Since then I've felt that no matter whatever difficulties and challenges have occurred in my life and career, if Stravinsky said "I CAN STAY" then now, 50+ years later, I’m still here and I've stayed and intend to stay till the very very end, like he said I could! Lately I've been trying to assemble all the different facets of my works. But because of the schizy nature of the Art vs Music vs Film vs Performance scenes over the past 40-ish years, they've often been mish-mashed around and poorly understood and so I've decided to integrate it all into a larger context that I call "CharleWorld"! I like to work somewhat like a microbiologist and create big Petri dishes where I choose and place bacteria cells (composition) and then let them germinate and grow by themselves (improvisation). In my kingdom of creation, I am a strong believer that too much practice makes things artificial and imperfect. All work and no play makes Jack a dull boy. That's pretty much of a CharleFormula too. I have always felt and heard and mixed the sounds in my world as liquids not as solids. Sonic liquids are material that is endlessly transformable. In my case I have no problem with Derek Bailey's definition. But I’m not crazy about people who go around defining stuff. If Stravinsky said "I CAN STAY" then now, 50+ years later, I’m still here and I've stayed and intend to stay till the very very end, like he said I could!